OMG, you guys, I have sun room updates galore. So much is happening out there right now, you’ll be amazed. But I forgot my camera cord today so I can’t post any pictures of the action. Instead you’re going to be treated to a recap of our canning adventures on Saturday. I took all these pictures with my new Blackberry Q10. I know I am the only person on the planet to own one of these phones, it makes me feel special. Ahem. Saturday morning Natalie and I drove over to the Falls Church Local Market and bought two flats of tomatoes and a box of peaches. Natalie has all the canning equipment because she made peach preserves for her wedding favor a few years back. She also has a six-burner stove top, which is ideal for this type of undertaking. 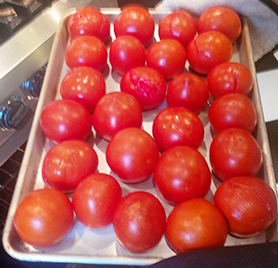 We started with simple, whole, peeled tomatoes. I’ve found that placing them on a roasting sheet in the oven at 400 degrees for about 30 minutes works just as well as blanching them in regards to removing the skins. So that’s what we did. No need to score the skins ahead of time or rub them with olive oil, just place in them in the oven like so. You’re not trying to really roast them, so it’s ok to load the tray down as full as you can. They will be ready when you see a few whose skins have already burst a little. About 30-40 minutes. Once the tomatoes have cooled enough to handle, you can easily peel them. 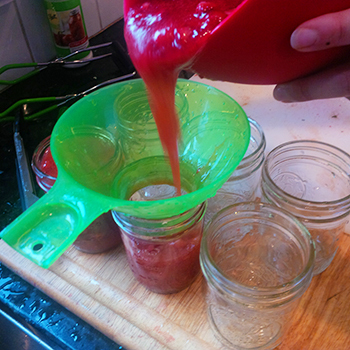 While the tomatoes were roasting, we started the water for our canning pot. 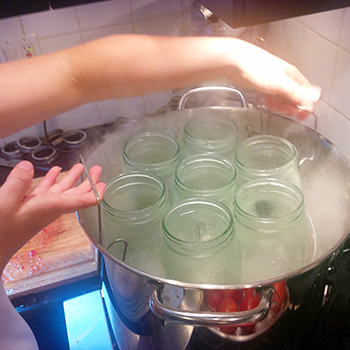 Once it came to a boil, we added the first set of jars to sterilize. 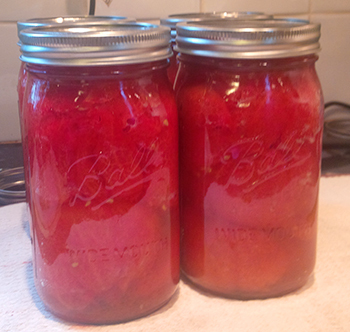 We used these 1-quart jars for the whole peeled tomatoes. Don’t they look pretty? We are by no means canning aficionados, so I’m not going to go into alot of detail about how we did each of these, but I can recommend www.foodinjars.com for helpful tips, tricks, and recipes. And I can tell you that we used this handy set from Target in addition to the large pot with canning rack, and it was money well spent. 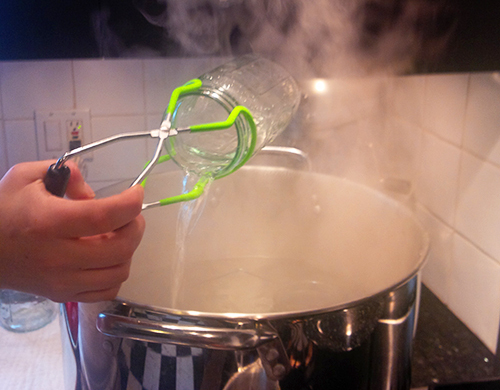 The tongs were great at getting the jars in and out of the hot water. 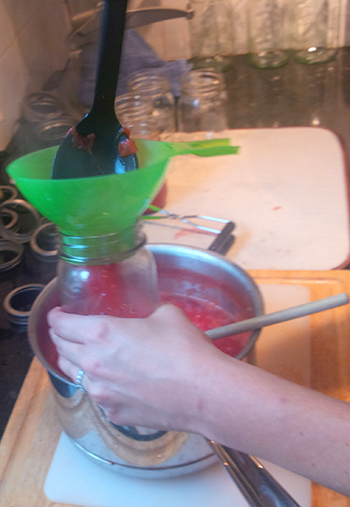 The funnel was a lifesaver when it came to pouring the food into the jars. 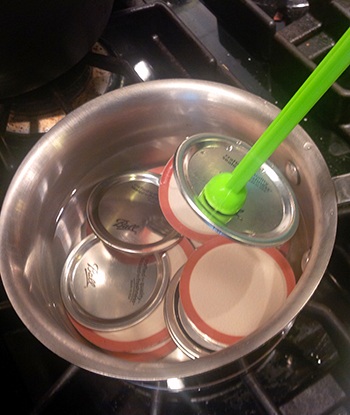 And we all loved using the magnetic “wand” to procure the lids from the pot on the stove. We didn’t have this set of accessories two years ago when we did this for the first time, and it was alot mess-y-er/burn-y-er. In addition to whole, peeled tomatoes, we also canned diced tomatoes for things like chili. 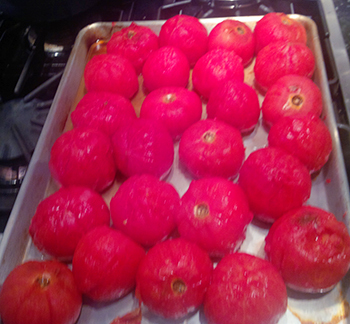 For these, we blanched the tomatoes quickly and then plopped them in an ice bath to stop the cooking. 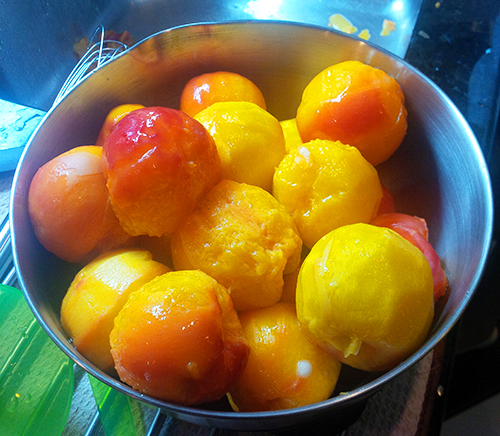 When you do the tomatoes in the oven, they tend to get a little smushy and since we were going to dice them, we went with the blanching method so that they would remain firm. Once we diced them up, we put them in a pot to cook over medium/low heat for about 30 minutes before putting them in the jars. For these, we used these pint size jars. At this point we had a lot of jars waiting to go into the water to be preserved, so we decided to make some freezer ready strawberry jam. The cool thing about this recipe, that that it’s no cook. 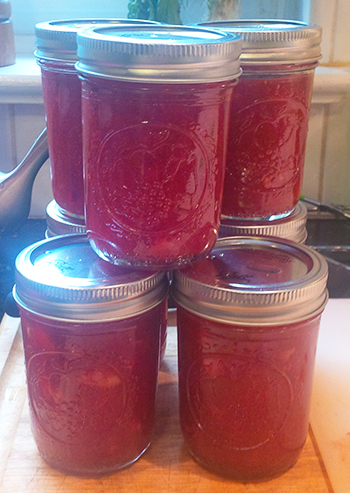 We simply chopped up some strawberries, added sugar and pectin, and put them in jars. Easy peasy lemon squeezy. 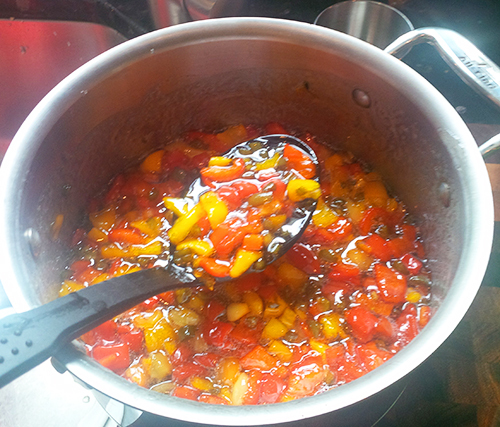 …chopped them up, added some sugar, and cooked them down into this. Here’s what they look like in their jars. We tasted a little of it, so delicious! I can’t wait to throw some over a log of cream or goat cheese one day this fall/winter while watching some football with friends. Easiest appetizer ever! 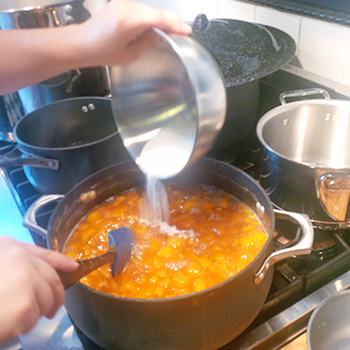 And last but certainly not least, we made peach preserves. Natalie got excited and bought an entire box of peaches. We didn’t use all of these, but we did make quite a dent. All told we used 13 cups of chopped peaches for the preserves. 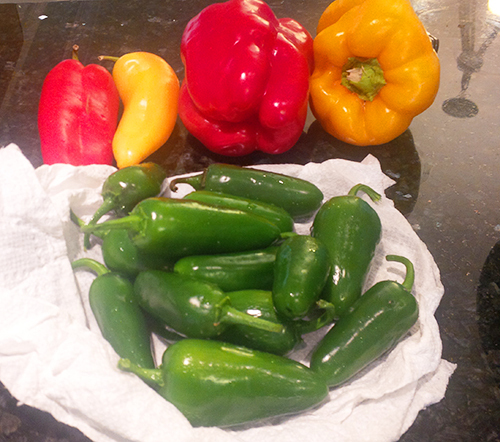 First we blanched and peeled all them all. Then we chopped these puppies up and put them in a pot with a boat load of sugar. Sidebar: fruit preserves are a little like sausage; you kinda don’t want to see how it’s made because it might disgust you. It’s ALOT of sugar, yo. 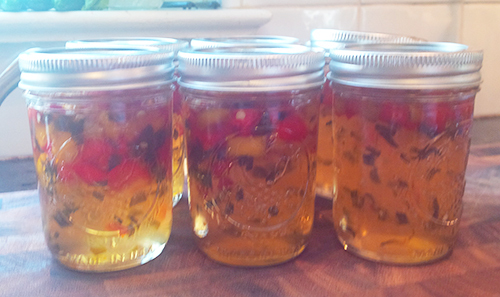 Here’s what the preserves looked like after cooking for about a hour. 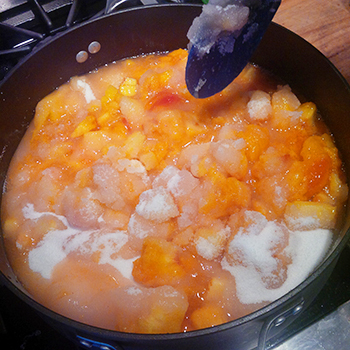 We’re adding the pectin before letting it cook a few more minutes. We used both pint and half pint sized jars for the preserves so that people could have their choice. The small jars are great for gifts and company and the larger jars are perfect for making one of my favorite winter recipes. Yum! So that’s what we did Saturday. It really didn’t take long at all. Natalie and I left for the market around 9:45 a.m. and Julia joined us around 2:30 p.m. 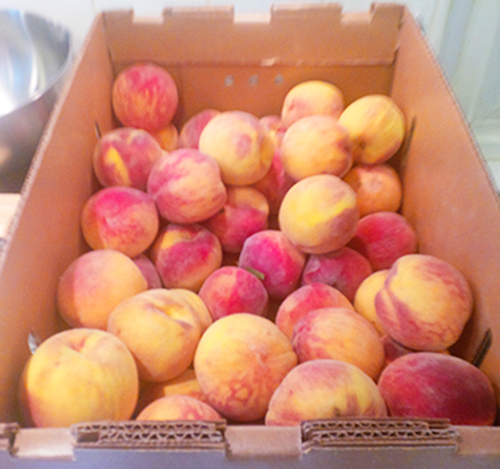 I kicked out around 3:30 p.m. with only the peach preserves still needing to go in the water bath. All told we made about 30-35 jars in under 7 hours. And we had so much fun doing it, we’re thinking of doing it again next weekend. The tomatoes are so easy and it’s so awesome to have your own canned tomatoes in the dead of winter that everyone agreed they wouldn’t cry if they had a few more jars in their pantry. So that’s the story on our second year of canning. I’m so grateful that Natalie has not only the tools but the kitchen and stove big enough for us to take on this adventure every year. Oh and while I was up the street putting food into jars, Mark and his brother were laying sub floor (Yay!) so I will be back with a post all about that as soon as I can find my camera cord. Of course! What can I send you?